I hope everyone had a wonderful long weekend; I know I most certainly did! We were able to plant our garden and all my flowers, along with making a nice dent in the regular spring yard cleanup. I'm absolutely exhausted but when you have 3 full days of nice weather you have to make the most of it! Of course when you accomplish a lot outside, nothing gets attention inside...which means that the pile of laundry is a mile high and more importantly my stamp room is collecting dust! I have tons of ideas, just have to get in there and get them onto paper - until then I have a card I made for Mother's Day but could be easily transitioned to an any other occasion card just by changing the sentiment. I really like using this window frame technique and its so simple to do! My favorite part of this card though? 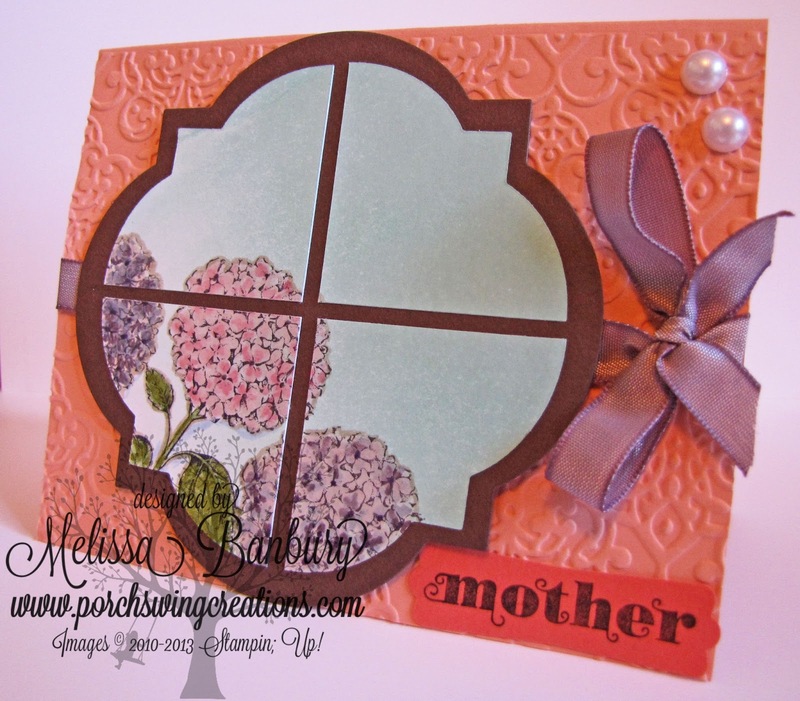 I had a chance to use one of the brand new In Colors as my card base - what do you think of 'Crisp Cantaloupe'??? To create the window frame, choose two framelits, one slightly larger than the other. With the largest framelit, cut from Chocolate Chip cardstock; the smaller framelit from Whisper White cardstock. Brayer the Whisper White frame with Soft Sky, working on an angle from the upper right to the lower left. Stamp the Hydrangeas with Black Staz-On ink and color in using the MARKER LAYERING TECHNIQUE. 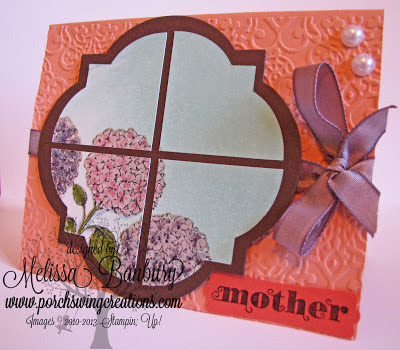 Cut this finished piece into quarters and glue onto the larger Chocolate Chip framelit, spacing each quarter to leave a small frame around each piece, creating your window frame. Think of all the things you can do with this cutting technique - a window scene for all seasons! Remember that there is only 2 weeks left in the Spring and Annual Catalogs! If there is anything you'd love to acquire before its gone for good, place your order soon! 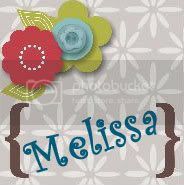 Melissa, this card is just wonderful, like this technique..
Hydrangeas are one of my favorite flowers, soooo....going to try this 'window' out sometime. I hope the new items you have in the USA-catalog will be available here tooooo in the Netherlands. Melissa, thanks for sharing this technique. I always find your cards so creative! They inspire me.